Get the foundational knowledge about health sciences librarianship. The general term “health sciences libraries” covers a wide range of areas beyond medical libraries, such as biomedical, nursing, allied health, pharmacy, and others. Introduction to Health Sciences Librarianship provides a sound foundation to all aspects of these types of libraries to students and librarians new to the field. This helpful guide provides a helpful overview of the health care environment, technical services, public services, management issues, academic health sciences, hospital libraries, health informatics, evidence-based practice, and more. This text provides crucial information every beginning and practicing health sciences librarian needs—all in one volume. Introduction to Health Sciences Librarianship presents some of the most respected librarians and educators in the field, each discussing important aspects of librarianship, including technical services, public services, administration, special services, and special collections. This comprehensive volume provides all types of librarians with helpful general, practical, and theoretical knowledge about this profession. The book’s unique "A Day in the Life of . . . " feature describes typical days of health sciences librarians working in special areas such as reference or consumer health, and offers anyone new to the field a revealing look at what a regular workday is like. The text is packed with useful figures, screen captures, tables, and references. 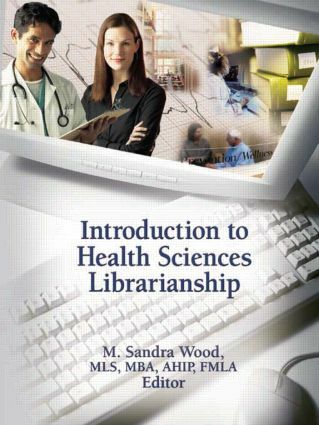 Introduction to Health Sciences Librarianship provides essential information for health sciences librarians, medical librarians, beginning and intermediate level health sciences/medical librarians, and any health sciences librarian wishing to review the field. This crucial volume belongs in every academic health sciences library, hospital library, specialized health library, biomedical library, and academic library.